Injections are commonly used by pain specialists, both to help diagnose the painful condition and to help treat the painful condition. What is the difference between diagnostic and therapeutic injections? 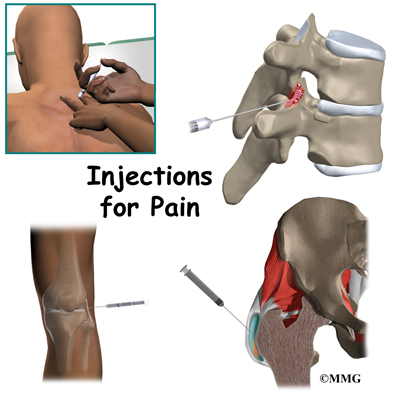 Injections used for pain management can be divided into two categories: diagnostic injections and therapeutic injections. Diagnostic injections are intended to help your doctor determine what part of the body is causing the pain you are experiencing. The part that is causing the pain is sometimes referred to as the pain generator. Diagnostic injections are used by your doctor to determine the pain generator by a process of elimination. You should also understand that there may be more than one part that is painful. There may be several pain generators. The process of finding the pain generator begins with a careful history and physical examination. This may lead to a differential diagnosis. The differential diagnosis is a list of all the possibilities that the physician can think of that best fit with the findings from the initial history and physical examination. Once the differential diagnosis list has been determined, the goal is to figure out which item on the list is actually causing your symptoms. The next step may be to obtain x-rays, MRI scan, or CT scans. Each of these radiological tests gives your doctor information about the structure of your spine, bones and joints. These images may show abnormalities that may account for your pain. For example, a spine x-ray may show arthritis of the joints of the spine that could be causing the pain that you are experiencing. But, simply because the structural abnormality could be causing your pain does not mean that it is. Structural abnormalities are commonly seen on radiological tests. Many of these abnormalities are not necessarily causing pain. The rationale behind diagnostic injections is simple: If a structural abnormality identified on the radiological tests is causing your pain, and if your doctor can inject that structure to temporarily numb that and only that specific structure and the pain stops temporarily, then it makes sense that this is what is actually causing your pain. It is also likely that you may have several abnormalities visible on the radiological tests. It may be unclear which abnormality is the cause of your symptoms. For example, you may have several intervertebral discs that appear worn out on the MRI scan of your lumbar spine. It could be that all of the discs are causing your pain - or it could be that there is only one disc causing your pain. If you are considering surgery, you would want to be sure which disc is causing the pain so that you did not undergo any additional, unnecessary surgery. Finally, your pain may actually be coming from somewhere else in your body altogether. For example, it is not uncommon for a patient to have a worn out hip joint and a worn out lower back. When a patient with this combination of problems has hip and thigh pain, it is not always obvious whether the pain is coming from the hip joint or being referred from the lower spine - or both. 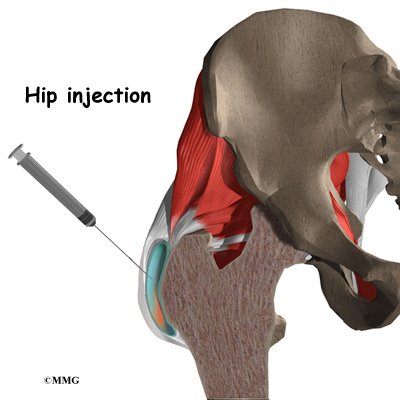 By injecting the hip joint with medication to temporarily numb the hip joint and eliminate the pain that is coming only from the hip, the physician can determine what portion of the pain is coming from the hip joint - if any - and what pain is originating from the spine. This helps diagnose the problem accurately and prevent any unnecessary procedures. Almost all diagnostic injections follow a similar strategy. First, determine what could be causing the pain. Next, inject the structure that is most likely the cause of the pain with a medication that should reduce or eliminate the pain temporarily. If the pain is eliminated, then the structure injected is almost surely the cause of the pain. It is the pain generator. Unlike diagnostic injections, therapeutic injections are intended to treat your problem. Therapeutic injections are used when your doctor already has a very good idea what structure is the pain generator. This means that therapeutic injections should be expected to reduce, or eliminate, your symptoms for some period of time. Injections rarely eliminate pain permanently. But, some injections may last weeks to months. To prepare for the procedure your doctor may tell you to remain "NPO" for a certain amount of time before the procedure. This means that you should not eat or drink anything for the specified amount of time before your procedure. This means no water, no coffee, no tea - not anything. You may receive special instructions to take your usual medications with a small amount of water. Check with your doctor if you are unsure what to do. You may be instructed to discontinue certain medications that affect the clotting of your blood several days before the injection. This reduces the risk of excessive bleeding during and after the injection. These medications may include the common Non-Steroidal Anti-Inflammatory Drugs (NSAIDs) such as aspirin, ibuprofen, naproxen and many other medications that are commonly used to treat arthritis. If you are taking any type of blood thinning medication you should let your doctor know. You will most likely need to have this medication regulated or temporarily discontinued prior to the injection. Your doctor will need to determine if it is safe to discontinue these medications in order to have the injection. Injections are commonly performed in several different settings. Some simple injections may be done in the office. Other injections that require special equipment may be done in the operating room, the radiology department or a surgery center. 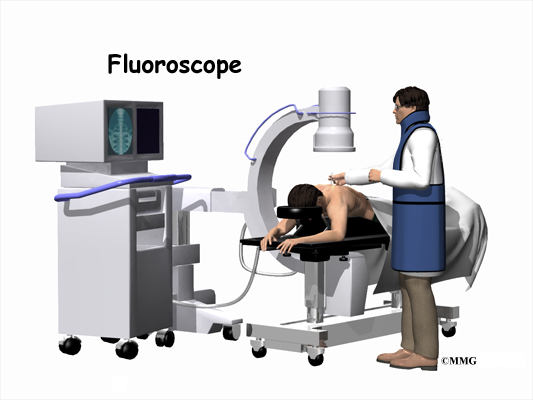 Many injections are done with the help of fluoroscopic guidance. The fluoroscope is an x-ray machine that allows the doctor to actually see an x-ray image while doing the procedure. This allows the doctor to watch where the needle goes as it is inserted. This makes the injection much safer and much more accurate. Once the needle is in the right location, a small amount of radiographic dye is injected. This liquid dye shows up on the x-ray image, and the doctor can watch where it goes. The medication used for the injection will go in the same place. The doctor wants to make sure the injection will put the medication where it can do the most good. Once the correct position is confirmed, the medication is injected, and the needle is removed. The medications that are normally injected during a therapeutic pain injection include a local anesthetic and some type of cortisone, or steroid, medication. A local anesthetic medication, such as lidocaine or bupivicaine, is the same medication that is used numb the area when you are having dental work or having minor surgery, such as a laceration sutured. The medication causes temporary numbness lasting one hour to six hours, depending on which type of anesthetic is used. 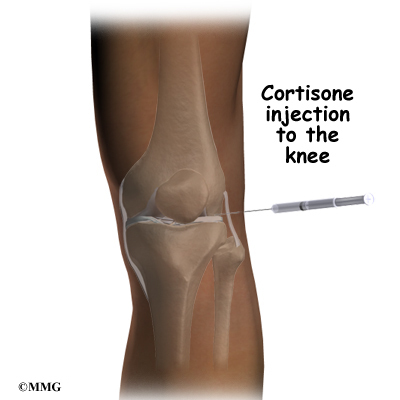 Cortisone is an extremely powerful anti-inflammatory medication. When this medication is injected around inflamed, swollen nerves and connective tissues, it can reduce the inflammation and swelling. Decreasing inflammation reduces pain in joints. Reduced swelling can allow the nerves to function better, reducing numbness and weakness. There are several complications that may occur during or after these injection procedures. Injections are safe and unlikely to result in a complication, but no procedure is 100% foolproof. This document doesn't provide a complete list of the possible complications, but it does highlight some of the most common problems. Complications are uncommon, but you should know what to watch for if they occur. Like most procedures where medications are injected, there is always a risk of allergic reaction. The medications that are commonly injected include lidocaine, bupivicaine, radiographic dye, and cortisone. Allergic reactions can be as simple as developing hives or a rash. They can also be life threatening and restrict breathing. Most allergic reactions will happen immediately while you are in the procedure room, so that help is available immediately. Most reactions are treated effectively and cause no permanent harm. You should alert your doctor if you have known allergies to any of these medications. Bleeding is rarely a problem after the injection, but can be serious if it occurs. An epidural hematoma occurs when one of the small blood vessels around the spinal sac continues to bleed after the procedure. The bleeding can cause a large pocket of blood to form around the nerves and cause too much pressure on the nerves. If this complication occurs, you will probably need a surgical procedure to drain the blood and remove the pressure from the nerves. Several types of infections are possible complications of pain injections. Any time a needle is inserted through the skin, there is a possibility of infection. Before any injection is done the skin is cleansed with a disinfectant and the health care provider doing the injection uses what is called sterile technique. This means that the needle and the area where the needle is inserted remains untouched by anything that is not sterile. The provider may also use sterile gloves. Infections may occur just underneath the skin, in a muscle, in a joint or in the spinal canal itself. You should watch for signs of increasing redness, swelling, pain, and fever. Almost all infections will need to be treated with antibiotics. If an abscess forms, then a surgical procedure may be necessary to drain the pus in the abscess. When the infection occurs in the spinal canal, it may be much more serious. A condition called an epidural abscess may form inside the spinal canal. This infection can cause a large pocket of pus to form around the nerves creating pressure on the nerves. If this complication occurs, you will probably need a surgical procedure to drain the infection and remove the pressure from the nerves. Antibiotics will also be necessary to treat the infection. Many pain injections are done close to nerves. The needle used to do the injection may accidentally puncture the nerve itself. This can cause damage to the nerve and result in increased pain. Numbness and weakness may also result. Nerves that have been punctured with a needle will usually recover and not require any additional surgical procedures. Not all injections work as expected. Sometimes, injections cause more pain. This may be due to increased spasm in the muscles around a trigger point injection into a muscle. The increased pain is usually temporary, lasting a few hours or a few days. Once the medication has a chance to work, the injection may actually work as expected and reduce your pain. The pressure from injecting the liquid medication may increase pressure on nerves. This may irritate the nerves and cause increased pain. The increased pain is usually temporary. Increased pain that begins several days after the injection may be a sign of infection. You should alert your doctor if this occurs. Probably the most common complication of injections that enter the spinal canal is a wet tap. This occurs when the needle penetrates the spinal sac and enters the spinal fluid. This is the same thing that happens when your doctor performs a spinal tap or a spinal anesthetic. In itself, it is not dangerous. 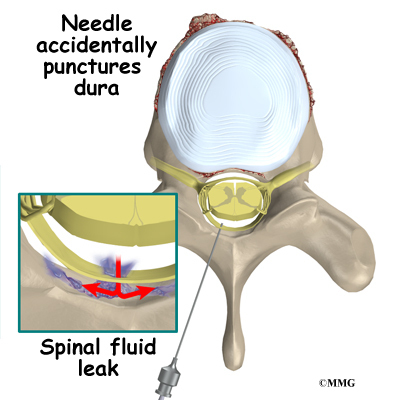 Because the epidural needle is larger than the spinal needle, the hole in the spinal sack may continue to leak and not seal itself off immediately. This causes a spinal fluid leak - or wet tap - and a very bad headache. The headache is worse when you are sitting or standing upright. It may cause nausea and vomiting. It will go away if you lie flat or with your head a bit lower that your feet. The headache occurs because the spinal fluid pressure in the skull decreases. That is why the headache goes away when you lie down - the spinal fluid pressure goes back to normal in your skull. Most spinal headaches go away in a few days when the hole in the spinal sac heals and closes. You may be instructed to stay flat for a couple of days until this occurs. There are ways to speed up the healing of the puncture in the spinal sac. The most common treatment for a spinal headache that does not go away on its own is a blood patch. This may be done at the time of the injection if the doctor sees that the spinal sac has been punctured before he removes the needle. If not it may be done several days later if the headache has not gone away. This procedure involves taking a small amount of blood from a vein in your arm and injecting it into your back in the epidural space. The blood clots and patches the hole. If everything goes as planned, you will be able to go home soon after the injection, probably within one hour. After most types of pain injections, you will probably not have any restrictions on activity or diet following the procedure. When the pain injection is a diagnostic injection, your doctor will be interested in how much the pain is reduced while the anesthetic, or the numbing medication, is working. You may be given a pain diary to record what you feel for the next several hours. This is important for making decisions, so keep track of your pain. And remember, injections are not usually a cure for your pain; they are only a part of your overall pain management plan. You will still need to continue working with the other recommendations from your pain management team.